Create your own custom sign or browse our large selection of high-quality sign designs. Most signs can be personalized in your choice of colors and text type styles with names, dates and more and are great for everyone on your list and for any occasion. We feature totally custom signs, personalized family name signs, rustic outdoor signs, lake or cabin signs, couples wedding signs, famous quotes signs, pet signs and much more. While we also offer variety of sign styles using a variety of materials we specialize in creating vinyl wood signs with your content at affordable prices. You think it and we'll make it! Create your own custom signs for the home and office or select from our many signs ideas. Most can be personalized and have a fast turnaround time. These high-quality signs are a hit with everyone on your list including Groomsmen, Dad, Children, Mom, Families and more. 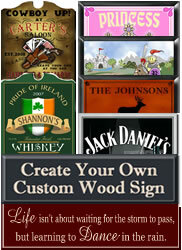 Choose from signs for the bar, den and signs for everyone on your list. Design your own custom sign for your own home or as a gift! Just visit our Custom Sign section and select a single layer or double layer sign style.